What if I pay the $14.99 membership fee and then find out your site does not have what I want/need? For starters, you will be able to do a search before signing up for membership to find out if we have information on the individual you are looking for. If once you sign up, the information we have is not the individual you are looking for, you can contact us with the name and any info you have and we will search our records to find this person and post his info and email you back. Why should I join My Veteran Family when I can do my own search of Military Web Sites for free? You can do your own searches. You must however know the information you are looking for in order to do the search. For instance, your family member may have served in the Navy. But, do you know which ship of duty station? You need to know this info in order to find out more. Many ship sites only list the individual’s name and little else. We have done extensive research combining the information from many many historical sites, National Archives, National Personnel records, etc. After the initial $14.99 annual membership fee, what other fees or charges can I expect within the web site? There is never going to be any additional charge for any information on this website. We will be adding records on a daily basis and you can come back again and again to search the site. All records posted on our website are included in the membership fee. 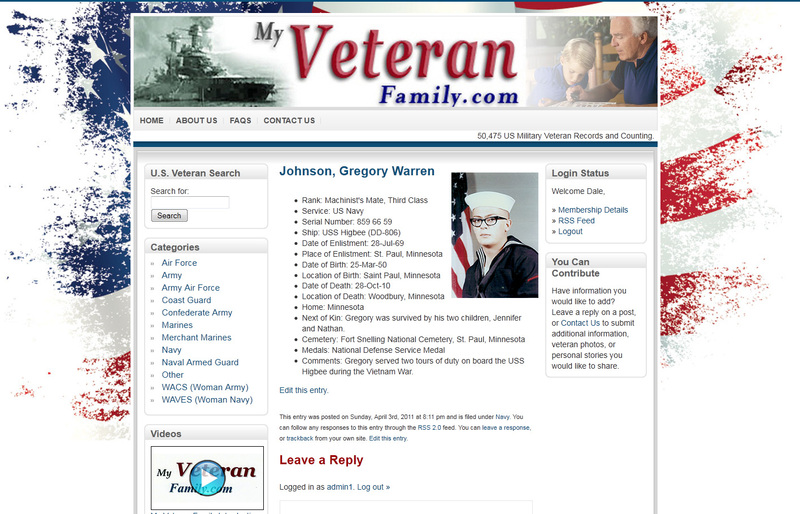 Who is able to view the information on My Veteran Family? Anyone can do a search for an individual on the website to see if we have information on them. In order to view the actual compiled record, you must have a membership. How do I know your data is reliable? All information used to compile an individual on the website is taken from actual historical records. American Battle Monuments, National Archives, National Personnel Records, Air Force, Army, Navy, Marines, Historical sites and many more. If it is not verifiable through actual historical records, it will not be added to an individual’s record. Can I see a sample search (or search results page) before I join. How do you determine whether information submitted is reliable? The information must be verifiable with historical records. Individual family stories will be accepted on an individual once we have determined that the person you are reporting on is the same person as we have records for. How long will it take to get a response from you if I don’t find the information I need and you do a special search? We will get back to you within 24 hours to let you know if we have information on the individual. If we have to do an extensive search with the National Personnel Records, etc. we will let you know this and it may take considerably longer; depending on the availability of a researcher. You must realize that the National Personnel Records had a fire on July 12, 1973, that left the top floor of the military personnel records facility in ruins. This floor had contained some 22 million personnel folders, filed alphabetically, for U.S. Army personnel discharged from 1912 through 1959 and of the U.S. Air Force discharged from September 1947 through 1963. At the time of the fire, one-third of the air force records already had been relocated and thus saved, but overall, fewer than 4 million records were recovered, either entirely or with as little as one identifiable document. What information will I need about the person I am searching for in order to do a search? How can I submit information, stories, or photos about a veteran? We currently don’t have an upload feature, but you can use the contact form to get in touch with Claudia.